Charlie Dressen was a star high school and amateur athlete in many sports in Decatur and the Midwest. 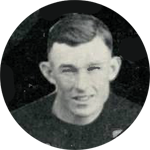 He quarterbacked the Staleys club team in 1919 and was the reserve QB on the 1920 Staley’s team. He subbed in four games that year and never got to play in a game at Cubs Park in Chicago. He was paid about 37% as much as Pard Pearce the starting QB. His best sport was baseball and after six years in the minor leagues he played mostly second base in eight major league seasons. He then managed 16 seasons with major league clubs and 8 with minor league teams. His most success came while managing the Brooklyn Dodgers 1951-1953. He died of a heart attack in 1966 while he was manager of the Detroit Tigers.